Manufactured by Simplex, the Simplex 125 time clock provides businesses the ability to track time in one of two modes: as a time clock or as a time & date stamp. It features an assortment of user-selectable formats and it offers a variety of date & time print options. 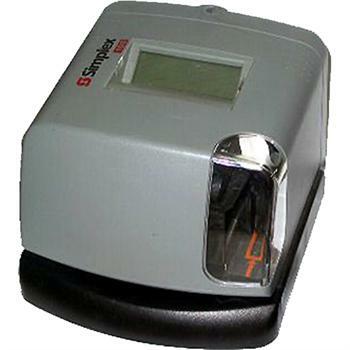 The Simplex 125 incorporates a wide array of features such as: any combination of time, date, number and comments, 2 font selections providing either 20 or 26 character print display, customized comments and the choice of printing one of four languages The Simplex 125 is perfect for office and industrial warehouse alike, for businesses that require printing of time, date, and text on documents, receipt of mail, as well as employee time recording, job costing, and dispatching. The Simplex 125 can be mounted on a wall as a time clock or placed on a table top for use as a time & date stamp. With its attractive yet rugged design, the Simplex 125 is perfect for both office and industrial environments.